150-170 George Street, Sydney. Digital id 4481_a026_000128. Australian wheat harvest. From NRS 20499. By 1914 the population of Australia had reached nearly five million people and there were 1.8 million people living in New South Wales. Of that 1.8 million, 40% lived in Sydney and the surrounding metropolitan suburbs, making Sydney Australia’s largest city. 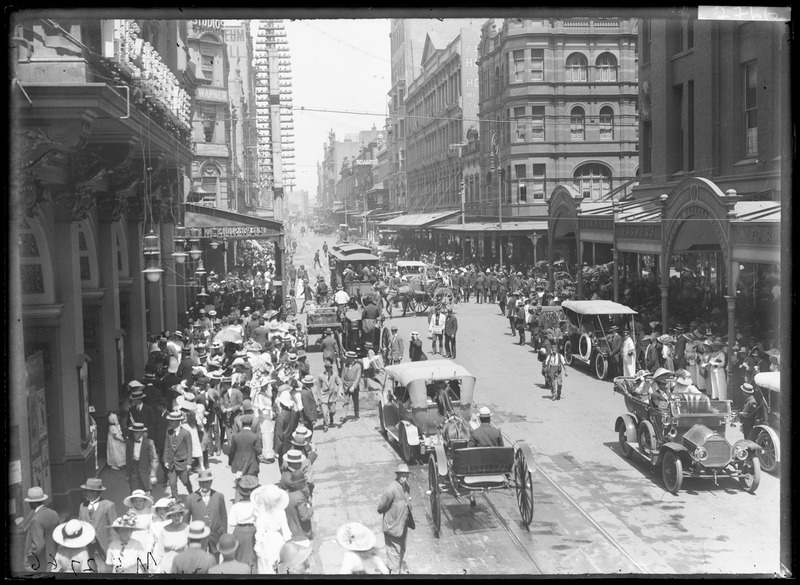 There would have been a hustle and bustle around the streets of Sydney, with trains and the dockyards evolving to keep up with trading demands. Trade in imports and exports had been increasing for the last seven or eight years so the state’s outlook was one of “prosperity and progress”. Leading the way were the state’s exports of pastoral products such as butter, meat, wheat and wool, the majority of which were exported to the United Kingdom. 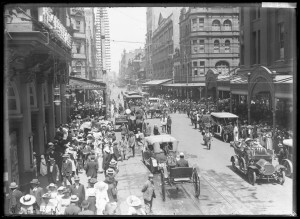 On the streets of Sydney electric lighting was replacing the old gas lamps and motor cars jostled with horse drawn carts. Electricity hadn’t reached private houses though, so wood and coal fires were used to cook and heat. Ice chests were used as refrigerators and the long drop or backyard toilet was a familiar sight (and smell) for most families. a quart of milk cost just over 5s. At the movies you could see Mary Pickford in Tess of the Storm Country or an Australian film like ‘Neath Australian Skies, produced by Raymond Longford and starring Lottie Lyell at the Crystal Palace or Lyric Theatre in Sydney. All these films were, of course, silent features and in black and white. View war time feature film flyers form our collection. On the sporting field Australian Norman Brookes won Wimbledon, Kingsburgh won the Melbourne Cup, South Sydney won the NSW Rugby Football League and Port Adelaide was the Aussie Rules champion. Daceyville, the Garden Suburb, a new concept for city housing was being built in Sydney’s south east. On 1 July 1914 Norfolk Island was transferred from the NSW government to the Commonwealth government and became an Australian Territory (Fig. 6). [Fig. 8] Anthony Hordern ad, 1914. From AK698, Vol. VIII No. 11 November 1914, p.366. As talk of war in Europe grew, storm clouds gathered at home. In the winter of 1914 smallpox again broke out in Sydney, although the strain was not as virulent and not as many people died as in the previous winter (Fig. 5). necessary to exercise the most vigilant care in all departments of the State’s activities to guard against the probable adverse conditions prevailing. take advantage of an international crisis, or of a domestic necessity, to ask one penny from our customers. Unemployment rates were up and many families were struggling on half-wages. With the outbreak of war, families now faced the prospect of fathers, sons and brothers going off to war. (1) Official Year Book of New South Wales, 1914, New South Wales Government, 1915, pp81-85. (2) State Archives New South Wales: Premier’s Department; NRS 12060 Letters received, [9/4697] 15/1430 p.1. (4) Official Year Book of New South Wales, 1914, p.882. (5) SANSW: Colonial Secretary; NRS 905 Main series of letters received [5/7302] 14/49744 and 19/44844. (6) NRS 12060 [9/4697 ] 15/1430 “New South Wales in 1914” report, p.1. (9) SANSW: AK698, Education Gazette, Vol. VIII No. 11 November 1914, p.366.